Bordeaux Dynamo. 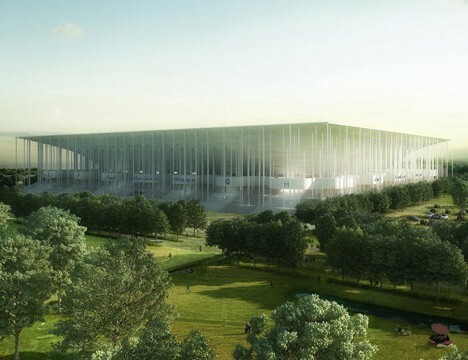 Herzog & de Meuron designed a new stadium, the Stade Bordeaux Atlantique for the UEFA Euro 2016 in France. According the the architects, the “diaphanous volume looks out onto the grand landscape, its transparency revealing all the energy and activities which will fill this new symbol of the city of Bordeaux’s dynamism.” Via Dezeen. Big Bunker Castle. According to Curbed, Steven Huff, chairman of TF Concrete Forming Systems, is building a 72,000-square-foot personal concrete manse called Pensmore. Located on 500 acres in Missouri, the reinforced concrete chateau is built to resist the regions rough weather. “The whole house is in essence a storm shelter,” said the Pensmore web site. Humble Abode. If 72,000 square feet is a little too big for your tastes, Treehugger found a slightly smaller abode proposed by TATA, the same company that launched the $2500 car in India. For 32,000 rupees, or about $720, you can have your own house, clocking in at just over 200 square feet. The company hopes the new dwellings, along with an ultra-affordable $7,800 apartment, will help ameliorate India’s growing housing problems in poor communities.